Why would Jim Abbott be hitting on his card? What better way to represent Jim Abbott, a player with only one hand, then by having his 1991 Upper Deck card show a picture of him hitting. The pictures that baseball cards companies select often times make very little sense. 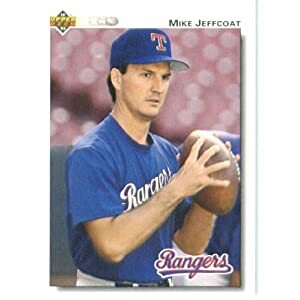 Take this Mike Jeffcoat Upper Deck card as an example. Why they have him holding a football when he doesn’t play that sport I have no clue. Since Abbott was on the Angels and the American League uses a DH and Interleague play didn’t start until 1997 this picture has to be from Spring Training. Talk about really digging into the well to try and find a picture to use. Jim Abbott was an amazing athlete. When he was with the Yankees in 93′ Abbott pitched a no hitter (against the Indians). While that’s impressive it isn’t as impressive as the fact that he went 2 for 21 for his career as a hitter. Yep, that’s right, he had two career hits. Amazingly both hits came off of Jon Leiber and he actually drove in three runs on those two hits. I can’t imagine that he faced Jon Leiber more than a handful of times so it’s safe to say that Jim Abbott owned Jon Leiber. Burn!